India is a place which has to be explored and experienced making it one of the best-sought tourism destination. With the introduction of E-Visas in 2015 more and more Australian citizens have been visiting India, E-Visas made it easier to avail India E-Tourist visa for Australian citizens. As per the latest reports published Australian tourists as a result of the introduction of E-Visas account for about 4% of the total number of tourists to India. This article will guide Australian citizens on how to apply for an India E-Tourist visa. 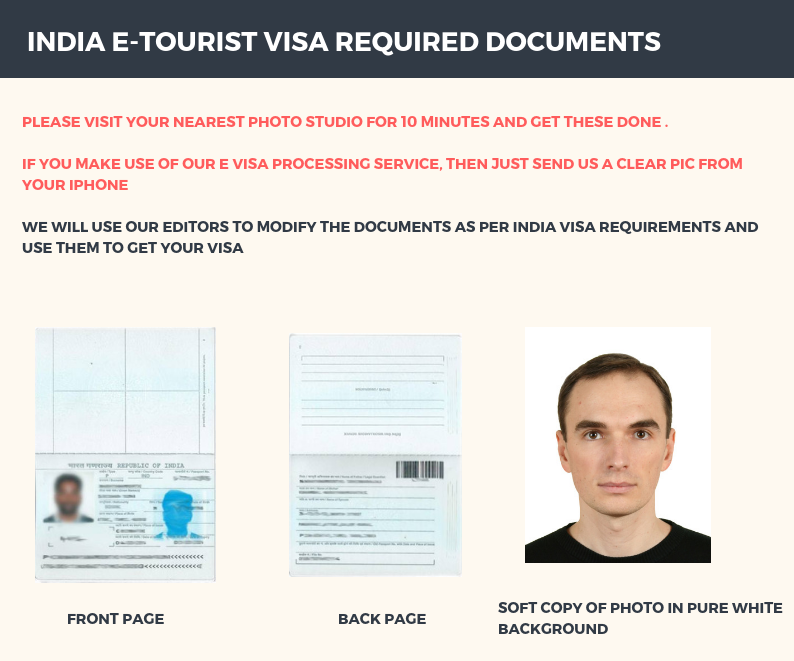 How to get India E-Tourist visa for Australian citizens below government fees ? This is how I got my visa at AUD100(actual fees is AUD190). This works best if you have not booked your flight, hotel and insurance for your India trip. You will receive an email from indiavisainfo.com about your visa fees in 1 hour. Your visa fees can be anywhere between AUD100 to AUD150. You need to just accept the quote no payment needed yet. Do Australian citizens need a visa to visit India? It was made mandatory for all nationals visiting India to have a valid visa before arrival at any Indian ports. Australian citizens must apply for a right visa and get it approved before arriving in India. In fact, foreign nationals arriving at Indian ports without a valid or and proper visa shall be deported back to their country. Is it possible for Australian citizens to get a visa on arrival in India? India does not provide visa on arrival to any foreign nationals because Indian replaced the existing visa on arrival system with E-Visas. E-Visas cannot be applied for at any of the ports as it takes a minimum of 2 days to get your E-Visa approved. Choosing an appropriate India visa for your purpose of the visit is as important as having a visa while arrival. Foreign nationals arriving in any of the Indian ports without the right visa will be denied entry into the country. Let’s have a brief discussion on the types of Indian visa. Sticker visas: These are regular visas with a validity of up to 10 years and multiple entry benefits. Regular visas have to be applied at the concerned Indian embassy after fixing a prior appointment. Australian citizens traveling to Indian solely for tourism for a period of not more than 60 days can avail an E-Tourist visa. What are the documents needed to apply for Indian E-tourist visa for Australian citizens? You should keep details about your parents’ passport details, details about your port of arrival in India and work-related information handy. One needs to be very careful while uploading the photograph and scanned copies of passport because even a slight variation from the desired specification or change in format will result in rejection of your application. However, If you are going to apply through a visa agent you need not worry as they will accept photographs and scanned copies in any format or size. They will later edit them to meet the required specification. However, while applying through the official website you need to be very careful with these documents, double check each and every document before you upload them because any deviation from the required specification will lead to rejection of your application. It is virtually impossible to take out the scamming websites and agents from the world of internet. The number of fake visa processing websites and agents have increased over the past few years. Due to the pathetic user-friendliness of the official website of the immigration department most customers fall prey to these scamming sites. These scam agents charge around $300 for an India visa which only costs $50. Another mode of scamming which they have come up with is the claim to procure something called an express visa. You need to understand that E-Visas are issued to you by the government of India.It takes a minimum of 2 days for your E-Visa approval. indiavisainfo.com: They are the only reliable visa processing agents we recommend all our customers. These guys are very dedicated and have a lot of experience in this industry making them able to provide the best in the class service. Above all, they charge only a very nominal amount as their service charge. indianvisaonline.gov.in: This is the official website of Indian immigration department. Frequent server crashes and poor maintenance make this site unreliable. There will be absolutely no customer support from them and above all, you will have to figure out each and every process on your own. How much does it cost Australian citizens for Indian E-Tourist Visa? It costs Australian citizens USD50 for an Indian E-Tourist visa. The visa agent charges USD50 as their service charge which is additional. Applying through an agent gives you a lot of relief as they will take care of the entire application process for you. Thereby saving you from all possible hassles the official website can give you. Whereas if you choose to apply through the official website you need to have a lot of patience because there are a lot of reliability issues with the website. The payment gateway is very much unreliable. The only agent we would recommend is indiavisainfo.com because they are a group of dedicated and expert agents who give so much of importance for customer satisfaction. More importantly, we have been doing business with them for the past few years and they have always got the job done with utmost perfection and timely delivery. Unlike other agents, they charge only a nominal amount of $50 as their service charge out of which only $25 is to be made in advance. They also have a very good team for customer support whom you can reach out any time for assistance. While submitting the form you need to make an advance payment of $25. After you submit the form an agent will take over processing your application form. He/She shall call you within 2 hours to collect the needed information. Though E-Visas were introduced to ease up the visa application process, unfortunately, the way the portal was designed causes a lot of problems. There are a lot of issues with the website out of which we will discuss the 2 major issues. The design process carried out while the website was developed was not done to keep up with the increase in demand over the coming years. Which made the website unable to handle traffic properly and causing a lot of reliability issues. One can expect the website to become unresponsive anytime while working on it. There aren’t any feasible solution to this issue other than to avail the assistance of a reliable India visa processing agent. These agents have so much of experience in this field that they keep on monitoring the website. These agents are very dedicated and will make sure that they get the job done for you. Unlike the issue with the part-1 application form where you can try as much as you want till you get through here in the payment portal, it is not possible. You get to try only a maximum of 3 times to make a successful payment. More importantly, failure to make a payment successful in 3 attempts will result in rejection of your application. An effective solution for this issue is to avail the help of a visa agent who can help you make a payment directly through any of the branches.You can avail the service of a visa agent for this issue. They will only charge $25 to make a payment against your application. No, India replaced the earlier existing visa on arrival system with E-visas in 2015. Foreign citizens should have a valid visa before arriving in India.